If you are a hot sauce fan like me this recipe is going to be right up your ally. 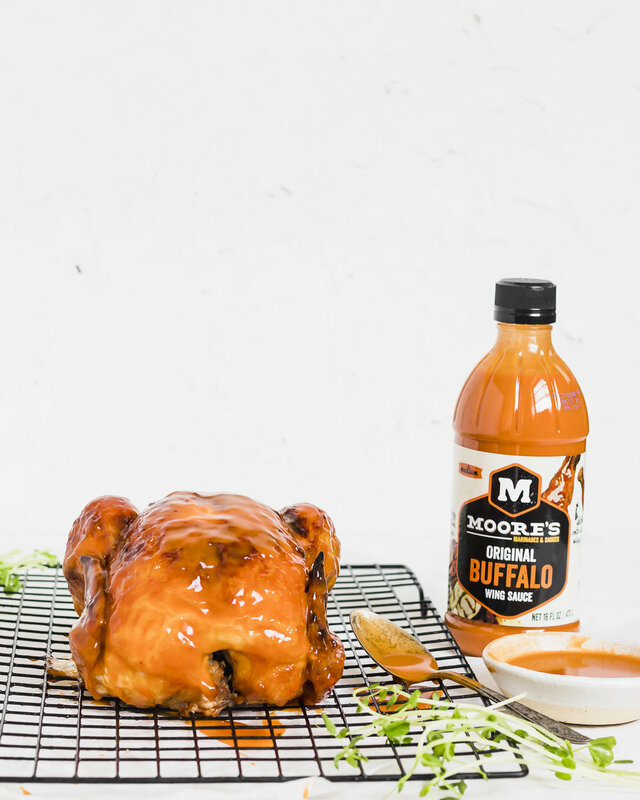 For my collaboration, I wanted to use this delicious Buffalo Hot Sauce by Moore’s, to make something would easily be included in weeknight dinners and meal prep. But also something you could make when a bunch of friends are coming over. Which means this dish has minimum prep before and clean up after. The only thing you need to do in advance is pat the chicken dry and let the skin dry a little in the fridge which contributes to a nice even browning of the skin. I wanted to maintain the authencity of this sauce and thats why i kept the flavors simple, while balancing everything out so that you get all the spicy, vinegary + tart goodness from the sauce along with the honey that adds a sticky sweetness and butter to round everything off. The chicken came out perfectly tender, juicy on the inside with a beautiful buffalo honey glaze on the outside. Roasting a whole chicken can sound intimidating at first, but I will take you through it and I promise this will be a breeze. I definitely recommend making an extra batch of this sauce to marinate veggies, tofu and wings for a big game night. I plan to make this Whole Roasted Chicken with Moore's Buffalo Honey Sauce for the holidays again and I am excited to see how everyone will enjoy it. To make the sauce - melt butter in a saucepan on medium heat, add Moore's Original Buffalo Wing Sauce and honey. Whisk together till everything has melted, set aside. For Chicken - Remove gizzards and pat dry with a paper towel and let sit in the fridge for 2 - 3 hours till the skin has dried a little. Preheat oven to 425F, remove chicken from fridge and truss the chicken using a butchers twine. Take butter cubes and carefully slide them under skin one on each breast, season the chicken with salt and pepper. Place the chicken breast side up on a wire rack with a drip pan under and roast in the oven for 30 mins, remove it an baste with the Buffalo honey sauce generously and put it back in the oven. Repeat basting again after 15 mins put back in the oven and baste again after 15 mins. You will be basting a total of 3 times. Chicken is cooked when the internal temp reaches 165F. Carve the chicken on a cutting board and serve hot with more sauce on the side.